The fluorescent light smothers me. My breaths are shallow and tense. The air is stale because my office manager doesn’t replace the air filters. The windows don’t open. It’s so bright I can’t see. I’m in an office building, in an office park, in a suburb, at a job that takes me almost two hours to get to each day. It’s like this every day. The dull pull of a routine that over the years, slowly, but unknowingly, settles us into sameness. Somedays I can’t even remember what day it is. I wake up, eat, work, eat, sleep, repeat. I’m not living life. I’m just getting by. I was letting the best hours of my life during the best years of my life burn out with each bi-weekly paycheck. I hated it. Every single day, I sat in a 4 feet wide, half cubicle watching the minutes of my life tick away. I spent all my time working or recovering from work. I was restless, anxious, and tired. I got so stressed about Monday morning meetings I couldn’t sleep. Then I got fired because I wasn’t making the company enough money. In August 2010 I found myself living back at home with my parents, who told me I could crash with them for three months while I looked for a new job. Over a few months, I had applied to over 200 jobs and had not received a single email or call back. I remember lying in my parent’s backyard looking up at the same sky I’d watched so many times as a kid and feeling lost. I was broke, with no prospects, and no real plan. You can only send so many resumes into the abyss before it starts crushing your soul. become financially independent as quickly as possible. I wanted more money. I wanted more life. A few days later, two things happened that would forever change the course of my life. The first was a single book, Your Money or Your Life by Vicki Robin and Joe Dominquez, that I’d found doing a search for best money books. The simple premise that whenever you are working for money you are actually trading your life energy blew my mind. On the back of a napkin, I calculated that in the 3 years after college I had traded 4,700 hours of my life for $87,000 after taxes but had nothing left. I also learned I was making a lot less money than I realized because whenever you are working for money you often have to spend more time on your job than the time you are sitting at your desk. The time it takes you to get ready in the morning, to commute, to shop for work clothes, to de-stress is all time that you wouldn’t have to spend on your job. When factoring in all of this extra time (time that I would never get back), I was actually making a lot less money than I realized. Because of my long commute, my real hourly wage was actually close to $10 per hour. To see how much money you are actually making, you can use this simple real hourly wage calculator. The second big moment came when I did a Google search on my phone and noticed a small advertisement at the top of the search results. Although I was sure I’d seen the small ads before, I’d never noticed they were actually ads. I was curious about how I’d been so well targeted and wanted to learn more. In only a few minutes I discovered that you can make between 15%-20% of someone’s budget for managing their Google ads, that I could learn how to run Google campaigns and get Google certified all for free online, and that demand could run digital marketing campaigns was high. I learned how to run Google ad campaigns by watching YouTube videos and within 45 days, I had a job at a digital marketing agency in Chicago making $50,000. Within a year I was making $300,000 with my full-time job and side hustles (11 different income streams at one time!). I launched my own digital marketing agency, then I partnered with two other guys and launched a second agency. I started side hustles and invested 100% of the extra money. I ended up with 14+ different income streams at one time. I came up with a solid early retirement strategy. I knew that every dollar I was investing would accelerate the rate of compounding, so I invested 40%, then 60%, then up to 80% of my income. My friends thought I was crazy since I was living in the crappiest apartment and driving the crappiest car you can imagine. I viewed saving as an opportunity, not a sacrifice. I kept at it, day after day. On November 16, 2015, I made it. 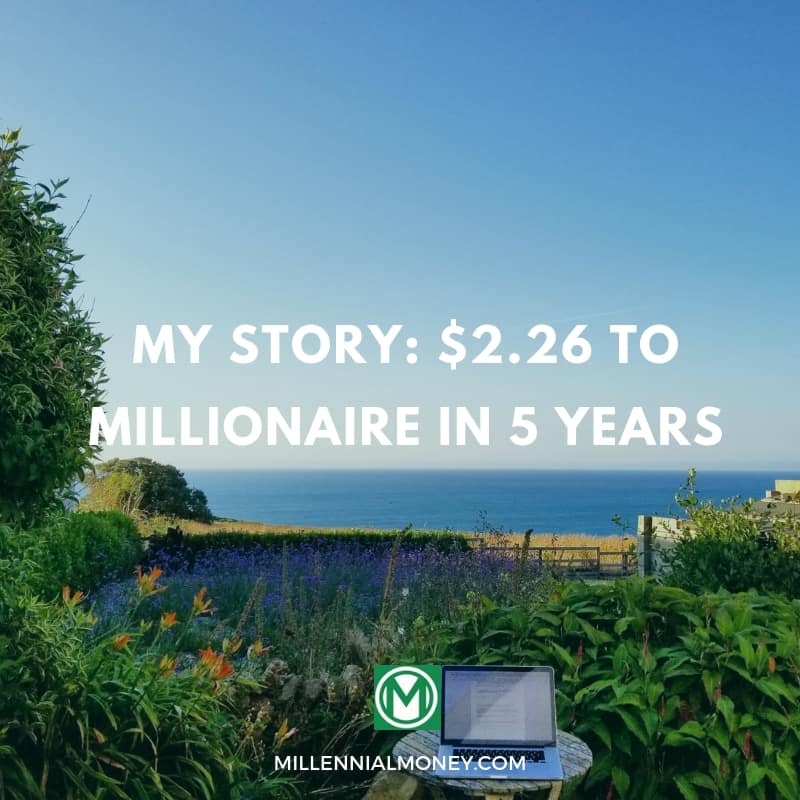 It took me exactly five years, three months, and six days to go from $2.26 in my bank account to $1.25 million and financial independence at the age of 30. On that day, I’ve never taken a deeper breath. I had the freedom to create, connect, and grow. To me, the purpose of life is to feel alive. It was one of the hardest things I’ve ever done, but it was a lot easier for me to do than it would have been 20, 30, 50, or 100 years ago. Almost all of the money I’ve made came from industries that didn’t even exist 20 years ago. 100% of the investments I’ve made through a few clicks on my phone. There have been few times in human history when the opportunity to follow your dream and live a life you love has been this accessible to so many. Yet, we spend so much time checking out and reveling in the easiness and conveniences of life. It’s making us numb. For most of history, your fate was determined by the family you were born into. But now you have access to tools, ideas, proven frameworks, and communities to help you rapidly accelerate financial independence. If you’re one of the “privileged” reading this, then you have an opportunity to be truly free. It all comes down to choices. You have two choices: what’s easy or what’s going to help you grow. Easy is the enemy. And so are apathy and convenience. So many people coast through life and wonder why they’re unhappy. Financial Freedom doesn’t come from easy. It comes from struggle and growth. It comes by doing something that counts, something that’s meaningful. I wanted to be an entrepreneur so I became one. The jobs of the future aren’t yet created. Are you an entrepreneur? I wanted to be a writer so I started writing. I went from napkins to blogging to books in 3 years. My first book get’s released in February. I wanted to travel. I’ve been to over twenty countries in the past few years. I wanted to be a teacher. Now I travel around the world teaching and connecting with people. If you would have told me this would be my life five years ago I would have laughed. I could have chosen the easy way, but I’d still be stuck. I chose and will always choose growth. It’s a Monday morning. I’m writing this in Cornwall, England on my patio overlooking the ocean. The sky is clear. Air crisp. The sun warms my face. A cool breeze sings. My feet are rooted. The hydrangeas next to me are exploding in color. My coffee tastes rich. This is all I wanted. I’m living my dream. 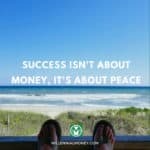 As it turns out success wasn’t about money, it was about peace. I feel calm, open, and alive. I have nowhere to be but here. 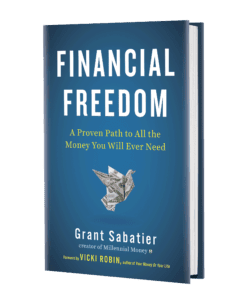 To learn more about how I achieved financial independence and you can too, check out my Financial Freedom book. 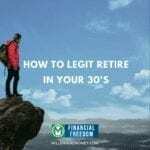 This is a guest post I wrote that originally appeared on Think Save Retire and was titled Living the dream after turning $2.26 into a million. Read this in the dimly lit, freezing office where I currently work. Definitely gives me the motivation to choose to grow and not take the easy way out. Life is too short to NOT pursue your dreams. People have such limiting views about work and about life. Kudos to you for thinking outside the box and achieving the life of your dreams. You’re an inspiration to many who are stuck in the constant cycle of 9-5 who want to break out! Love your site, love your story. You had motivation to accomplish this and you went all in. It is so possible to do this. It requires discipline and hard work, but it can be done. You’re proof. Thanks for sharing how you did it to help others. 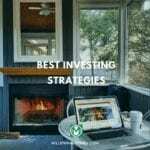 Your lessons on investing and lifestyle are important even for those who simply want to retire at all, and certainly any earlier than the (now rising) standard retirement age. Does your book have examples of ways other than selling ads or digital marketing to earn the initial money? Yes the book does DG!